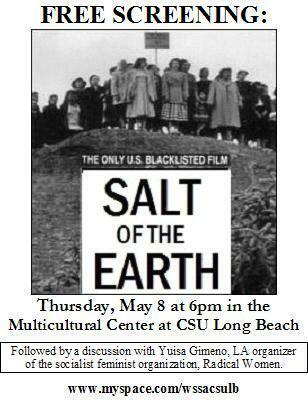 Please come to this FREE screening of Salt of the Earth, a very important film. Made in 1954 by actual union workers and members of the Hollywood Ten, this film was way ahead of it's time. It displays the intersectionalities of race, class, and gender and is the only film that has ever been banned. This is a free film screening event being put on by the Women's Studies Student Association (WSSA) at CSULB. Following the screening discussion will be led by Yuisa Gimeno, organizer for the LA Radical Women, a "trailblazing socialist feminist organization, Radical Women is the revolutionary wing of the women's movement and a strong feminist voice within the Left. Immersed in the daily fight against racism, sexism, homophobia, and labor exploitation, Radical Women views women's leadership as decisive to world revolution and trains women to take their place in the forefront of the struggle. RW is an autonomous, all-women's group, affiliated with the Freedom Socialist Party on the basis of mutual respect, solidarity, and shared socialist feminist ideals."